Tucked in a valley between green mountain walls with volcano-warmed water flowing over cliffs is a little hippy town called Baños. When we first got to Baños the sun was out and the air was hot. Immediately, we heard the sound of an ice cream truck echoing through the streets. Excited, we rushed around the corner toward the noise. Salvation! To our surprise, the cheerful music was not coming from an ice cream truck… it was coming from a garbage truck. Ecuadorians feel Baños is a bit touristy. They aren't wrong – there’s an adventure outfitter catering to tourists on just about every corner. But why wouldn’t there be? The natural areas surrounding Baños are so beautiful and varied they beg visitors to go out and experience them. We, of course, indulged in a few of these amazing activities. The first was a visit to the Casa del Arbol (Treehouse), which holds the famous “Swing at the End of the World” dangling off the side of a cliff. Needless to say, we swung into the void. Unfortunately the fog blocked our view of the valley below and the volcano above, but it was still exhilarating swinging out into the open air. 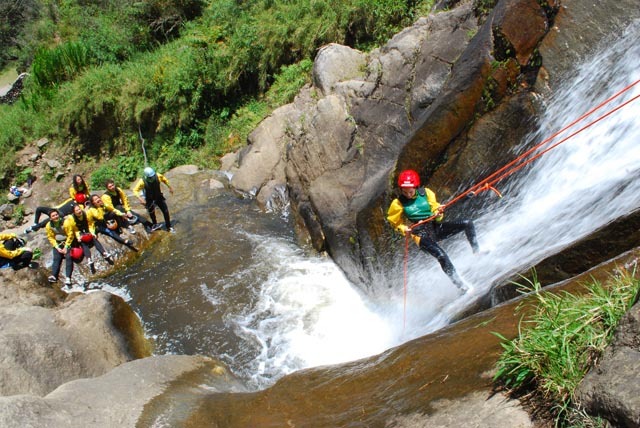 Next up: Canyoning, which is essentially rappelling down waterfalls. We got outfitted with wetsuits and climbed up a mountain. The only way back? Rappel, zip-line, and slide our way down a series of 6 waterfalls—some as steep as a cliff and as high as a two story building. Scary stuff, but at the end we felt like a badass Spider-Man. Note: Although we have photos of our canyoning adventure, they're trapped in a CD, which we can't access at the moment with our post-2011 devices. So the image above was found online here. We looked equally (if not more) badass, though. One of the top activities recommended by our Airbnb host was the hour-long bike ride to the Pailon del Diablo (the Devil’s Cauldron), a huge, powerful waterfall. He described it as a piece-of-cake, a quick ride going almost completely down hill. Along the ride you could see up to 16 waterfalls. For a $5 bike rental, this sounded like a no-brainer! We grabbed some bikes and hit the road. He was right, the majority of ride was downhill. Down some very steep and twisting hills, tunnels on the side of unprotected cliffs, a road where every car, truck and bus travels at top speeds. We had a few close calls and I, being the worrier I can be, would have persuaded Rolando to turn back had thought I it possible (I did try once). But that was not an option. We had to keep moving, so we sucked it up and pressed on. What’s an adventure without a little danger, right? I’m so glad we kept going. While the ride was a “white-knuckler”, we could see forests and waterfalls everywhere, and at the end of the journey was one of the most powerful waterfalls we’ve ever seen: El Pailón del Diablo. After ogling at it for a while, we hopped on the back of an old cargo truck and headed home feeling accomplished. For those of you Spanish speakers out there, you know Baños means bath. The city gets its name for the many thermal mineral baths (which locals call Termales) that can be found in and near the city. The water coming out of the cliff face is warmed by the nearby Volcan Tungurahua, and for a couple of dollars you can take a dip in the steaming hot water. Supposedly the water has healing properties – calming, circulatory, metabolic, respiratory… and my favorite, ‘a natural botox’. After a long bus ride from Quito, we headed straight to the baths, put on the requisite swim caps, and joined the locals for a Wednesday evening soak. There were four or five baths in this particular location: one was freezing cold, two were pleasantly warm, and one was lava hot. That’s the one we first lowered ourselves into, which with its yellow-tinged mineral water, felt like we had entered a pot of people stew and were being boiled alive. But after a minute our bodies adjusted and the water felt fine – we exited the bath a few minutes later feeling completely relaxed. I have to admit, the next day my skin felt smooth and tight... maybe those Botox claims aren’t complete BS? After Baños, we stopped by Guayaquil on the way to Lima, Perú. It’s the largest city in Ecuador, a port city located to the south of the country. Despite some warnings by locals to watch for pickpockets, we decided to stop by for a quick visit, and we’re sure glad we did. We got a great Airbnb with a delightful mother and her amazingly fun and friendly 3-year-old. The photos above show the sweet view from our room. The first Guayaquil highlight was a place a few people recommended: Parque Seminario, which is known to the locals as Parque de las Iguanas (Iguanas Park). Iguanas. Were. Everywhere. They sleep in the trees and during the day come down to sun themselves on the ground, seamlessly interacting with (or, more accurately, casually ignoring) humans. We loved seeing these creatures up close—me, because I’ve never seen a wild iguana before; Rolo because they look like tiny, living dinosaurs (and he’s obsessed with dinosaurs). Our Guayaquil Airbnb host mentioned the city has undergone a real transformation in the last 30 years. One of their crowning achievements is the redevelopment of the riverfront, an area called the Malecon 2000. The area has been transformed into a fun and safe location for local families and tourists to hang out. The area stretches for 3 km and is filled with parks, botanical gardens, restaurants, jungle gyms, shops, pirate ships and dozens of Millennials catching Pokémon (is there no end to the madness??). We visited the Malecon in the evening, enjoyed a nice walk and dinner overlooking the river. It was great to see so many people out enjoying themselves. Security guards patrolled the well lit area, and we felt safe in the middle of a supposedly dangerous city. I am writing this post as we’re on our 28 hour (!!!) bus ride through the coast to Lima, Peru. Sounds like hell, right? But we have an amazingly comfortable bus—leather reclining chairs big enough for Rolo to do yoga and our own personal TV screens loaded with lots of newly-released movies dubbed in Spanish (no better way for me to practice! ).